Well I’m back after a gorgeous few days down by the coast. 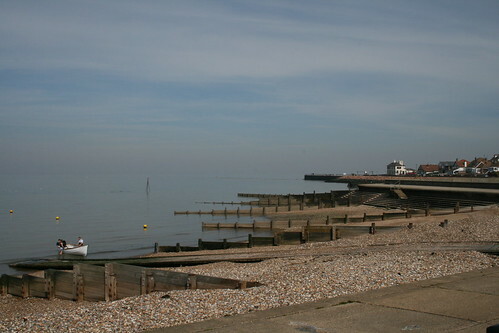 Britain has been blessed with exceptionally good weather this weekend and it looks set to continue into Easter Monday. I’ve eaten a lot of seafood, as I always do when I go down to the coast; clams, dressed crab, fish soup, langoustines. It’s my big treat as Rob doesn’t like shell fish. On Friday we brought some fresh live mussels (and a slab of tuna steak for Rob) back to the caravan and I cooked up the following dish. Clean the mussels well, scrubbing off any barnacles and pulling out the ‘beards’, the threads that protrude from between the shells. 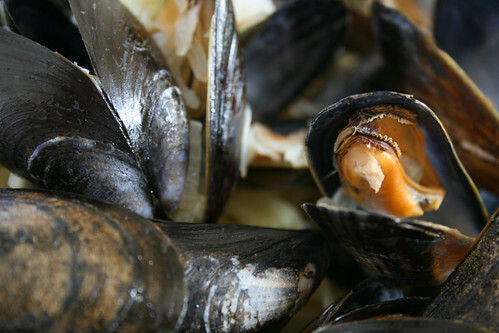 The rule with mussels is simple – before cooking discard any that are open and don’t close when you tap them, and after cooking discard any that remain closed. You should also throw away any that have broken or damaged shells. Gently fry a chopped shallot and chopped garlic clove in a knob of butter for a few minutes. Turn the heat right up and add a pinch of saffron, the mussels and a glass of white wine, then put on a lid and cook until all the mussels have opened. Remove the mussels and reserve the liquid in the pan. You can serve the mussels as they are with the broth in which they were cooked, but they are also fabulous with linguini. 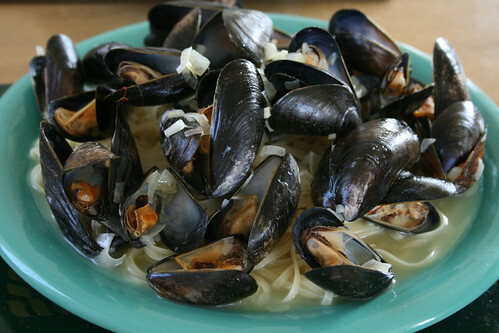 If you choose the linguini option rapidly simmer the mussel liquid to reduce it before pouring over the linguini and mussels. Be warned, this is messy to eat, but deliciously so. Eating mussels in polite company can seem a little daunting for the first time when faced with a bowlful of broth and mussels in shells. But it’s easy when you know how. Break the shells apart and use the shell with the mussel still in it as a spoon to scoop up the broth.